It's time for the Floriade again, Europe's once-a-decade floral bonanza. From April 5 through Oct. 7, all roads will lead not to Rome but to the southeastern part of the Netherlands, where the little-known city of Venlo —which lies in a self-described "region of flans, asparagus, mushrooms and beer"—is blooming like never before. There, a floral extravaganza called the Floriade is expected to draw 2 million visitors (20 times Venlo's population) to a site that not so long ago was wheat fields set amid evergreen, birch, and oak trees, some 5,000 years old. 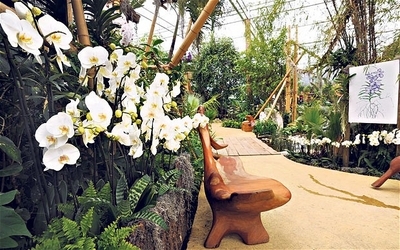 Now it's a 164-acre park, filled with 2 million new plants and designed to attract flower lovers from around the world. "We started five years ago," says John Boon, the landscape architect who masterminded the transformation. He left the forest undisturbed, except for adding paths and benches. But the fields have been planted, each with a unique look, theme—like "relax and heal" and "green engine"—and often a color scheme. In the international zone, about 40 countries, including Pakistan, Tunisia, Indonesia, Ethiopia, and Bhutan, will exhibit. China is making its first appearance. Even Burma will be there. "They have a lot of problems with their water, and they want help," says Paul Beck, the Floriade's managing director. Ninety commercial exhibitors will also be on site. What if you're not enticed by the prospect of seeing pretty flowers? The Floriade has other attractions: performances by acrobats and musical groups, street theater, brass bands, light shows, an open-air theater, and a cable car that soars 30 meters above the park. 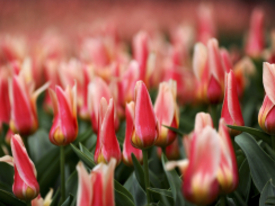 The Netherlands stages the Floriade, the largest flower expo in Europe and maybe the world, just once every 10 years. This particular world's fair of flowers cost €250 million to €300 million, says Beck, including all the infrastructure and two new permanent buildings. And it's not just about tulips, the country's symbol. "It's everything," says Debbie Van Bourgondien, who calls herself "the Bulb Lady" (that's trademarked) and who with her family owns Dutchbulbs.com in Virginia Beach, Va. She has gone to the last three Floriades. "If you are looking for the latest trends in gardening, the latest varieties, you'll find it there," she says. This year, there are 1.8 million bulb plants, 190,000 perennials, 18,000 shrubs, 15,000 hedges, 5,000 roses, and 3,000 newly planted trees of 250 species, plus fruits and vegetables. At the last Floriade, held in 2002 about 10 miles from Amsterdam at Haarlemmermeer, Van Bourgondien recalls being charmed by all the new miniatures on display. "I now have pots of miniature hostas around my patio," she says. Lee Buttala, a Connecticut resident who went to the 2002 Floriade, is another fan. "You see trends like ecological responsibility and planning with preservation in mind, and at the same time the Dutch pay attention to the beauty and the display," says Buttala, who has since become the preservation program manager of the Garden Conservancy, a nonprofit devoted to preserving great American gardens for the public. "There was a really great range of styles, from starker modern to romantic gardens. You can steal all sorts of ideas from the Floriade." The Floriade draws it biggest crowds from continental Europe, especially the Netherlands and Germany. The British, often viewed as the world's most avid gardeners, sometimes arrive by the busload. More Asians are expected than ever before. Lacking advertising, the Floriade is less well known in the U.S., and the contingent of American visitors is small. Still, Collette Vacations, which calls itself the oldest major tour operator in the United States, has built three tours around the Floriade. "We'll have a steady stream of groups going from April through October," says David Lutz, a product manager for Europe. The luxury yacht River Cloud II, which plies Europe's rivers, has also added a stop at the Floriade this year. "It struck a chord with flower aficionados and gardeners," says Michael McIntosh, the marketing manager for Sea Cloud Cruises. Yet the Dutch have taken a chance with this edition of the Floriade, staging it so far from Amsterdam for the first time. The Venlo area doesn't have enough hotels, and some visitors will have to motor in for the day—the average Floriade visit lasts seven hours—from Eindhoven, Maastricht, or Düsseldorf, Germany, each a little less than an hour's drive away. But there's a rationale. The Netherlands Horticultural Council is collaborating with the Venlo regional government to exploit the Floriade's economic flower power. When all the visitors go home, the area will metamorphose again—into a green business park. One building, the carbon-dioxide neutral Villa Flora, will be a corporate office building—"the greenest office in the Netherlands," Beck says. The other, the Innovatoren, is set to be an incubator for innovative sustainable agribusinesses. For now, though, the focus is on the present. Because the gardening set has been aging and shrinking in some countries, Boon says, "This time, we've put a lot of effort into getting families with children." Each display area has a playground, and the Floriade has devised special features for kids, like a jungle planted with secret codes and puzzles that when solved lead to the discovery of the King of the Jungle and a Tree of Delight containing a treehouse filled with interactive elements, both entertaining and educational. Meantime, in addition to ogling, moms and dads can also shop. "Mostly," says Beck, "you can buy anything here, and they'll ship it home for you, even big trees up to 50 meters tall."